A team of talented, intelligent and fun people are working hard every day to ensure PSA leads the charge in the electronic security industry. Each month we showcase one of our PSA superstars so you can get to know us a little better. 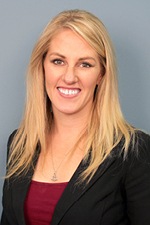 This month we’d like you to meet the newest addition to the PSA team, Brittany Richards. As I have only been with the company for one month, my job role is still taking shape. So far, I have assisted in tackling day-to-day marketing tasks as well as begun to establish a method to manage barter agreement marketing elements. While still in high school, I helped market my family’s teacher supply store through local events and sale promotions. After completing my Business Administration degree from the University of Wyoming, I held the title of Miss Rodeo Wyoming 2011 where I traveled the United States promoting the sport of rodeo and my individual sponsors using digital media. I was hired by one of those sponsors, Albany County Tourism Board, as Assistant Director where I capitalized on social media marketing and vendor management. I moved to Denver, CO at the end of 2013 to accept a position with a local western apparel/event company as their Social Media Specialist, managing their various social media platforms, digital marketing efforts, content gathering and live event coverage. I enjoy helping others and providing support where ever I can. I wanted to work for a company that shared the same values and PSA has established ways to assist various players within the security industry with commerce and education opportunities. It’s a learning environment where questions are always welcomed. Security is a new industry for me but everyone at PSA has helped me and provided numerous outlets for furthering my education. I have been riding horses since I was 4 years old and still find that time very relaxing and therapeutic. I grew up hunting, camping and fishing in the Wyoming mountains and am looking forward to spending this next summer exploring the Colorado mountains. On the weekends, I try to find local eateries and learn more about this area. I can change my own oil, tires and windshield wipers. I also became a guest blogger for the American Stroke Association after my mom suffered a massive stroke in 2014.